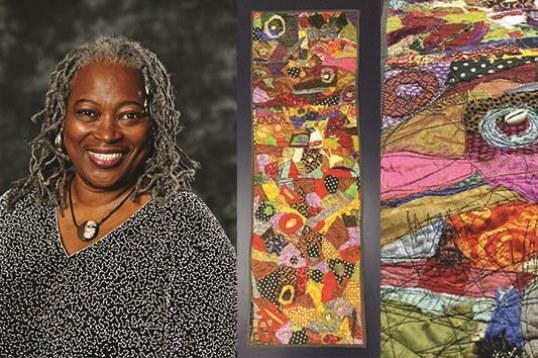 Come celebrate with Kimberley on her exhibit & the installation of her Circles of Protection quilt on the Duke Hospital Oncology floor. These events are free & open to public. More info. contact jennifer.collins3@duke.edu. "My father was a Baptist minister. He prayed incessantly for favor, family, guidance and for the souls of strangers. He often prayed through tears seeking purpose for his life in a rural North Carolina town called Hallsboro. When he was 83 and dying I asked him to lay hands on me to transfer blessings. I'll never forget how warm his large worn hand felt on my forehead as he petitioned for me through labored breath. I am his seed. I embody his consecrations. As a child of a preacher, I believe that there is healing in my art. In this work angels represent faith. Flowers represent gifts we give that bring pure joy. Sweethearts embody love that gives us hope. Each painted quilt has a prayer for healing prosperity and joy stitched between its layers. Each painting has prayers written underneath the coatings of pigment that form the images.